How do we find employment for people out of work in these difficult times? How do we help our members retain a healthy work ethic? How can we find work assignments for those on church assistance? After much discussion and prayer, the Lord confirmed our answer. About a year ago we started our Self Reliance Meetings for Sheffield 4 in the Rotherham Chapel. We started by teaching good housekeeping skills, budgeting, savings, food storage, basic life skills, job seeking and of course a one hour English class taught by our wonderful missionaries. As time went by and progress was made we decided to concentrate on giving assignments to live the gospel more actively. Daily prayer and scripture study were top of the list. Family home evening, home teaching, meeting attendance are still reported every week by members. This still left us short of a meaningful and rewarding work project. While looking for work opportunities on the Internet I came across a chap with a shoeshine stand in America. I was sure that we could do this in England. I put the idea to our members who at first were not sure they could do this. We looked at the film of the shoeshine on the street in America. This encouraged a little more confidence. It all changed when our Sunday School teacher referred to a picture of the Saviour cleaning the feet of His disciples. “This is what we will be doing at the shoeshine” he said. Tears were shed and enthusiasm was indicated that the idea was a good one. Following the guidance of the Self Reliance manual on running a business we had our members conduct a survey in the Rotherham City centre. We wanted to know how many people were wearing shoes we could polish. We found that 60% of passers-by are potential customers. We had work to do finding a place in Rotherham’s outdoor market; teaching members how to professionally clean and polish shoes and improve their English was the next task. We spent all our branch budget on polish, brushes, banners and flyers. A couple of weeks before Christmas we were ready to launch our Shoeshine Company. Members worked in three teams. The first shift was from 8am until 1pm, a second shift ran from 1pm until 4pm and the mid-day shift from 10am until 2pm covers the busy time. The results were that English improved, pride had been maintained and the community had been served and shown their appreciation for the work the church is doing. 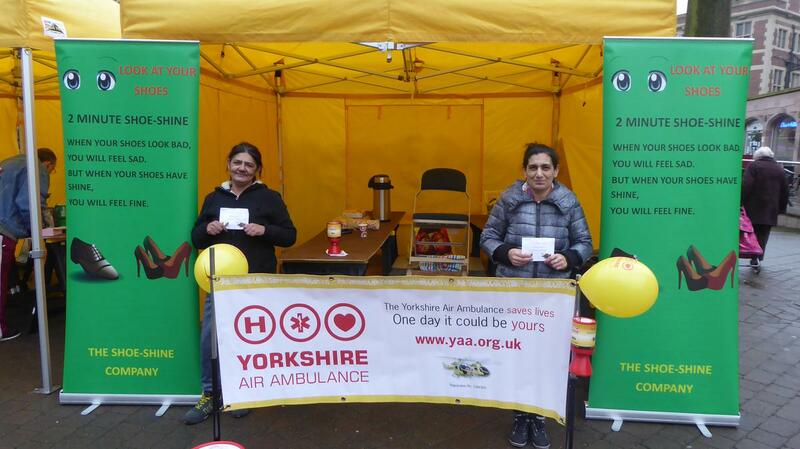 Members of the Slovak Branch donated through their shoeshine efforts £800 to the Yorkshire Air Ambulance Fund. Since the time of this article being written, both the Slovac and Rotherham Branches of the church have now closed.